I was excited to try out the SnoreRx. I’ve had several patients over the years come in with it and now I was to have my own test group from start to finish. Since I was lucky enough to get a few appliances, I asked some other women in the office if they knew someone who could benefit. The first of my testers is my friend’s housemate. The instructions are well written and easy to follow, and I strongly recommend you read them from start to finish. When they read the instructions, they decided not to try out the SnoreRx. One of the contraindications is loose teeth or dental implants. When you wear any oral appliance and clench you can create a suction. If that suction is strong enough, you can pull out loose or broken teeth. That risk is one of the reasons that I would strongly recommend that people check in with their dentist before starting with any oral appliance. Another reason is that the dentist can establish a baseline to watch for tooth movement or bite changes. The next tester is my friend’s boyfriend. He snores enough to disturb her sleep nightly. She was very excited to get him in the Snore Rx. They had no problems fitting the device. It was easy to fit. First you place it in hot water. It has a removable handle that makes sure that you don’t get too near the boiling water. Then you fit it to your mouth. Clenching for the full minute to get a proper fit can get uncomfortable, and the device must be removed with care to maintain the impression. But once you get it fit you don’t have to do it again. I really like that the inner liner is a soft thermoplastic. That little bit of give to the soft liner makes the device a lot more comfortable. My favorite tester is my husband. He has both a nasal and oral snore (and I’m a light sleeper!). He has to wear both an oral appliance and nasal strips or cones in order for me to be happy. That said, he’s the only one that didn’t like the Snore Rx. He found that it made his front teeth uncomfortable, and he was concerned that it might be pushing and moving his teeth (which is a warning in the instructions). After a few days and he decided to stop wearing it. The front teeth are an area that is sensitive for a lot of people who use an oral appliance. This is the reason that people transition from a semi custom MAD to a fully custom oral appliance. My final tester is my friend’s stepdad. Apparently his snoring was bad enough to hear from across the house and through multiple closed doors. They also had no problems with the fitting and it worked great. Unfortunately I found out after he started that he had a CPAP machine that he wasn’t using. While there are oral appliances that can take care of sleep apnea, they have to be tested with a sleep study to make sure that they’re working effectively. 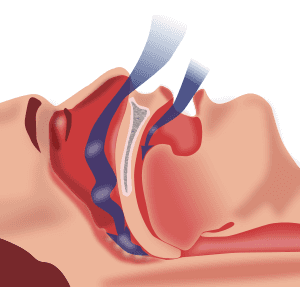 The SnoreRx isn’t FDA cleared to treat sleep apnea. The SnoreRx is FDA approved for snoring and for that, it does deliver. Every one of the people I had test this device got remarkably quiet. I love the adjustability of the SnoreRx. I found it easy to squeeze the upper unit and advance the lower jaw in 1 mm increments. One must be careful to adjust both sides evenly, so that you feel even tension in both cheek muscles. Uneven advancement can cause your your body to try to straighten itself out by fighting the appliance. This can lead to one-sided jaw pain. One of the keys to jaw advancement is to take it slow and the SnoreRx allows you to do just that. You might not have to go that far forward to make the snore go away. One of the drawbacks to the design is the mouth opening is a little small for dedicated mouth breathers. On the flip side, that limited opening won’t let your mouth dry out. It helps keep your jaw forward when you are on your back. All in all, I really liked the SnoreRx. I think that it’s a great option for people to use before checking in with their physician to make sure that they don’t have sleep apnea. The Snore Rx definitely does what it sets out to do. It would make a good temporary or quick fix snore guard. Dr. Christian has significant experience in Dental Sleep Medicine. As a Diplomate of the American Academy of Dental Sleep Medicine, the most renowned academy in this field, she has achieved the highest level of certification. Dr. Christian was born and raised in a small town on the Central Coast of California. She attended Cal Poly, San Luis Obispo before moving across the country to Boston to earn her Dental Degree at Tufts University. Since moving to Seattle in 2004, Dr. Christian has had extensive training in treating Sleep Apnea with oral devices while also owning and running her own dental practice. When she’s not making her patients feel better, Dr. Christian can be found gardening, reading, and chasing after her two beautiful, sweet, active girls.